I'm learning Python from your book and I'm finding it a great resource. However, I'm at the point where I'm creating the StickMan game and I'm having issues. I'm using an iMac running MacOS Sierra 10.12.6 The version of GIMP that I downloaded is 2.8.18. Specifically, I'm at Part III, chapter 15, "Creating the Game Elements-Preparing a Transparent Image". Steps 1 through 3 go well, but when I go to "Select -> All", there is no "All" in the "Select" menu. I am also having issues with the paintbrush as a dot. It shows up as a large square and will blot out most of the 27x30 image that I'm trying to paint. Gimp seems to be prompting me to add other layers, but I'm not clear as to how that will affect the image I'm trying to create. 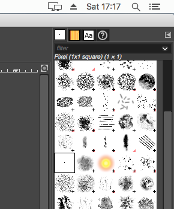 Finally, regarding layers in Gimp, those aren't necessarily an issue. 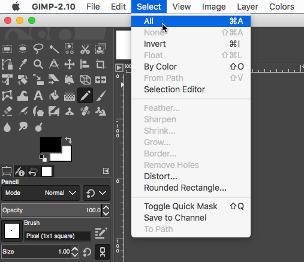 When you export the image (as a gif or png or anything else) it should collapse the layers into one -- and even if you find them annoying, you can click on the top layer in the layers dialog, select the Layers menu, and then click Merge Down to collapse into the next layer in the list.